We purchase our baby chicks when they are just one day old from a hatchery. They send them to us through the mail....I know, that's probably hard to believe but it's true! When they arrive, the post office calls us so we can go pick them up. After we get them all situated on the farm, they spend the next five or six months eating and growing before they will start laying eggs. 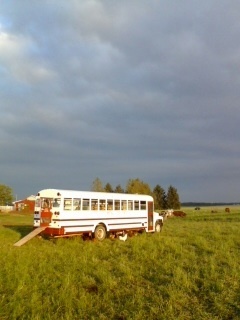 Our hens lay their eggs and sleep in an old school bus. All of the seats have been taken out of the bus leaving us room for nests and roosts. We have it designed to move through the pasture behind the sheep and cattle to spread manure and eat bugs and grasses. They also help to control parasites and help to fertilize the soil. It is a wonderful concept! We raise a variety of breeds including the Aracuna, Buff Orpington, Rhode Island Red, Barred Rock and Isa Brown. They all lay brown eggs except for the Aracuna. They lay a pretty blue-green colored egg.